This week’s 40+ style star Jamie is modern and hip and has the best (high heeled) shoes. Find out how to get some of that young, vibrant and youthful vibe into your style! Hi Jamie. Thanks for taking the time out to answer a few questions for 40plusstyle.com! Can you tell us a little bit more about yourself? I am fashion blogger from the fabulous state of New Mexico. 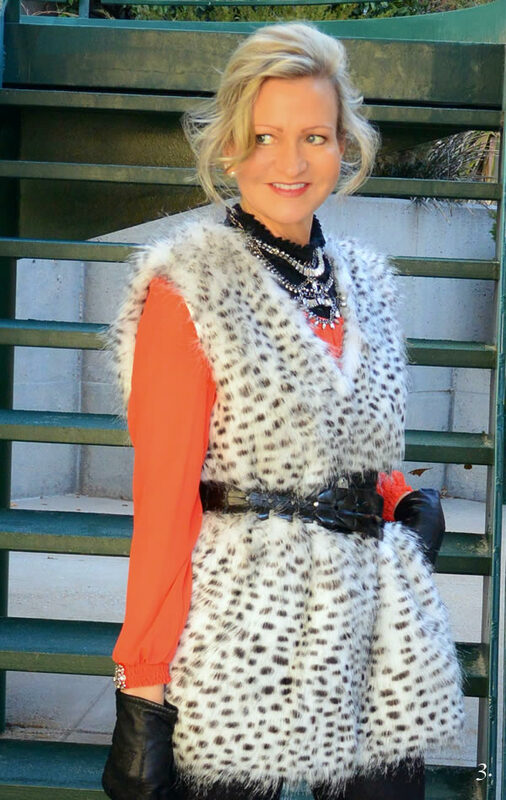 I also am the fashion expert on 2KASA Style, a local FOX affliate TV show. As a point of reference, which age group do you belong to or perhaps you are willing to share your age? Can you tell us a bit more about your blog More Than Turquoise and why you created it? I call myself a bit a of a fashion spaz because, really, I like everything. I simply don’t have a defined style. Just the willingness to try something new. I take into account my body shape and age-appropriate looks…. but I do have an open mind to different styles. I have lived all over the United States, but for the past 15 years I have lived in New Mexico. 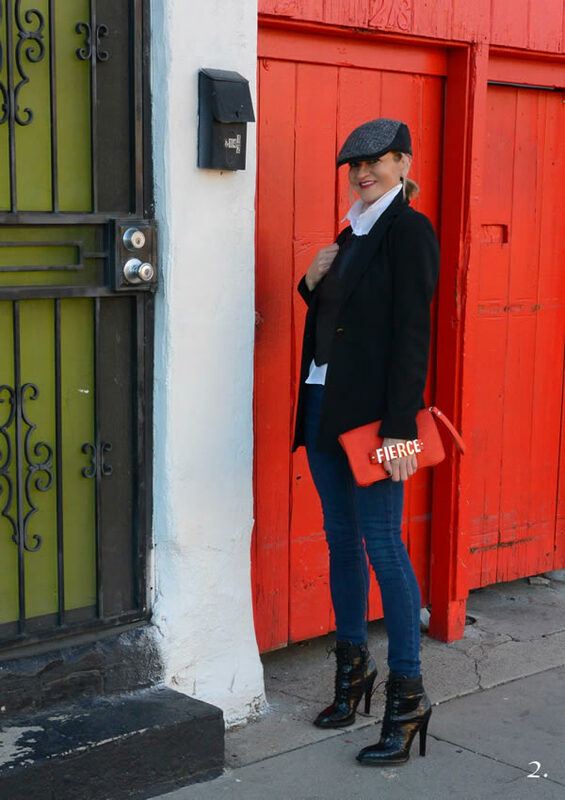 There is a heavy southwestern influence here and I incorporate it into my wardrobe. And, seriously, who doesn’t love turquoise and a great pair of cowboy boots? I am known for wearing large scale jewelry and pulling my hair back into a ponytail. Other than that, I try to surprise people. I get inspiration from so many different sources. I will say that if something doesn’t properly fit, it does not become part of my outfit. Absolutely. I have a pretty clear understanding of what colors look best on me and since I sometimes suffer from “muffin-top”, I’m not going to wear something that points an arrow to it. yes BUT I don’t want to dress too aged or dated. My makeup has changed quite a bit, too. To me this means not dressing like a teen trying to get into a club with a fake ID or to dress like grandmother’s bridge club attendees. I want to always be current and on-trend but I will toss a critical eye on my outfit before I venture out. If my husband chuckles or raises his eyebrow at my outfit, I’ll will go change. Would you say that at this stage of your life you are now more or less interested in fashion, style and the way you look? I have always been and will always be interested in fashion. Writing a blog and being on TV keeps me on my toes. I’m OK with this. Actually, I love it. When I think I look good, I feel confident in everything I am doing. I like this picture of me in this blanket coat because it gives a real “nod” to the southwest and has a real Georgia O’Keefe feel. I started wearing hats for the first time… and this hat and outfit did, in fact, make me feel fierce. Every year my girlfriends and I get together for a holiday lunch and try to out dress/bling each other. I won. I received more compliments on these earrings and my outfit as a whole. I felt pretty in this picture. I’ve been trying to me more creative with my photography on my blog and I felt that this fit the bill. Trends is my middle name. Currently loving the blanket coat and fringe. Just be willing to try something new. Never say “I can’t wear that” until you’ve tried it and you know for sure. I want to consistantly keep my blog fun and relevant and my photography fresh and creative. I want to continue to grow my follower base and continue to develop relationships with existing and potential sponsors. Additionally, I am considering adding “product” to my site. I LOVE to meet new bloggers. If anyone wants to say HI – please do so! 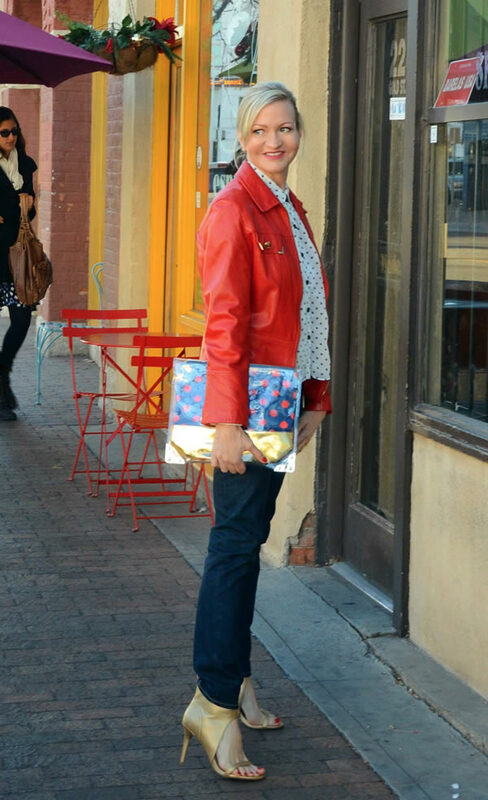 Be sure to check out Jamie’s blog More than Turquoise for more fabulous looks! Which of Jamie’s outfits is your favorite? Love your style!!! Very interesting post! LOVE morethanturquoise.com and look forward to every blog. She’s very funny and the clothes always spot on. Glad you featured Jamie. OMG she’s amazing! Can’t wait to follow her blog! She is good!! And probably has access to loads of stuff. Yummie. Love all her outfits. But that first photo is my favourite of these. wow – that coat, bag and belt in the 1.pic!!!! just wow! i like her bold style! and have no idea how she walks on this heels. soooo chic!!! You introduced me to Jamie on your post about instagram schtars! I clicked through and followed. And now I get to know her better through your interview. Thanks Sylvia! Wow, what a gorgeous, stylish lady! Thanks for this interview, Sylvia. Another fabulous mature blogger! I love her versatility! So many beautiful styles but the first one is my favorite. I spend several months a year in the American southwest and admit to agreeing with Jamie about turquoise and cowboy boots and sometimes cowboy hats too. The coat is spectacular! I have been following Jamie’s blog for about a month now and love her style and sense of humor. Thanks for another wonderful interview, Sylvia! I loved every style with the exception of holes in jeans. I love jeans they can go anywhere. I just don’t do holes. Thanks for introducing me to Jamie – love her style! Wow! What a cutie!! And Jamie has the BEST legs! She really knows how to dress herself. I’m for sure going to be following her. Jamie, I lived in New Mexico for one year right out of college. I lived on the Jicarilla Apache Reservation and worked as a volunteer at St. Francis Missionary School outside of Dulce. Oh, I love New Mexico! We are actually planning our summer road trip around there. What times!! I’m really looking forward to following you Jamie. Sylvia, these posts are my favorite. Now that I’ve found you, I’m savoring each one. You do wonderful work for all of us 40+ers!! Molto. belli anche tessuti e “abbinamento colori”!!! Thank you Sylvia for introducing us to Jamie! I enjoyed seeing fashion styles outside the NY and European realm. Not that that I don’t like those styles but because they do not fit my over forty California lifestyle. I found Jamie’s style very interesting and would totally wear the black jacket, jeans and animal print heels. That look rocks! These are great looks! The outfit in between #4 and #5 is phenomenal! Such great backgrounds in these images too, esp 1st pic and red door!! Jamie has the best style and is just as beautiful on the inside as she is on the outside! Previous post: Having more fun with prints – Choose your favorite from these 12 fabulous looks!